About 1,500 people chant anti-Trump slogans and clog city streets during march to the Capitol. 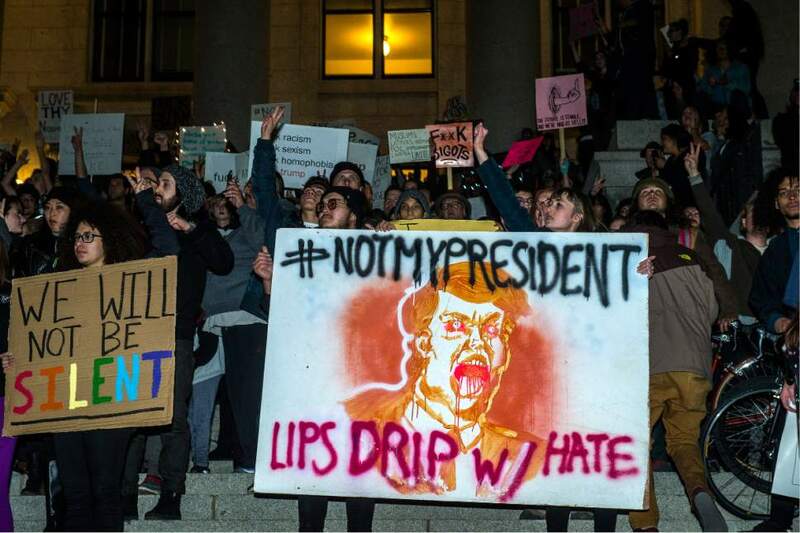 Chris Detrick | The Salt Lake Tribune Anti-Trump protestors rally at the Capitol Thursday November 10, 2016. Chris Detrick | The Salt Lake Tribune Anti-Trump protestors rally at the Capitol Thursday November 10, 2016. Chris Detrick | The Salt Lake Tribune Anti-Trump protestors rally at the Capitol Thursday November 10, 2016. Chris Detrick | The Salt Lake Tribune Anti-Trump protestors rally at the Capitol Thursday November 10, 2016. Chris Detrick | The Salt Lake Tribune Anti-Trump protestors rally at the Capitol Thursday November 10, 2016. 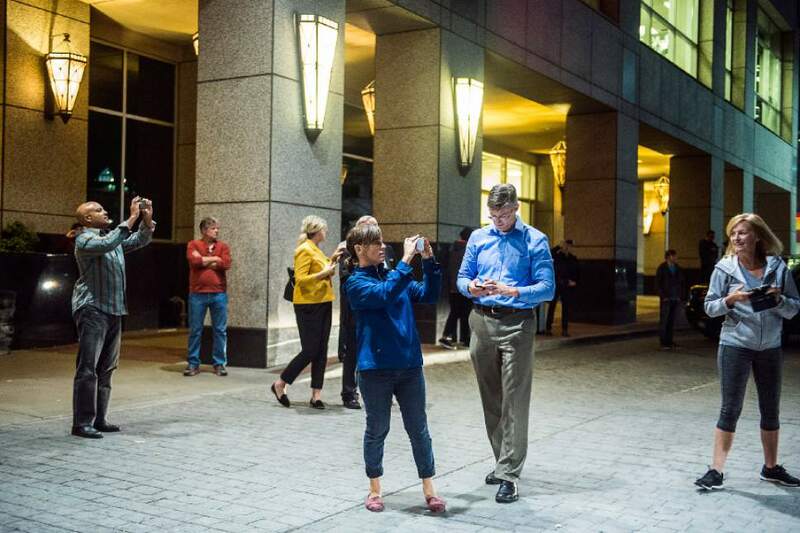 Chris Detrick | The Salt Lake Tribune Bystanders outside of the Marriott Hotel watch as anti-Trump protestors march in the streets in downtown Salt Lake City Thursday November 10, 2016. Chris Detrick | The Salt Lake Tribune Anti-Trump protestors rally at the Capitol Thursday November 10, 2016. Chris Detrick | The Salt Lake Tribune Anti-Trump protestors rally at the Capitol Thursday November 10, 2016. Chris Detrick | The Salt Lake Tribune Anti-Trump protestors rally at the Capitol Thursday November 10, 2016. Chris Detrick | The Salt Lake Tribune Anti-Trump protestors rally at the Capitol Thursday November 10, 2016. 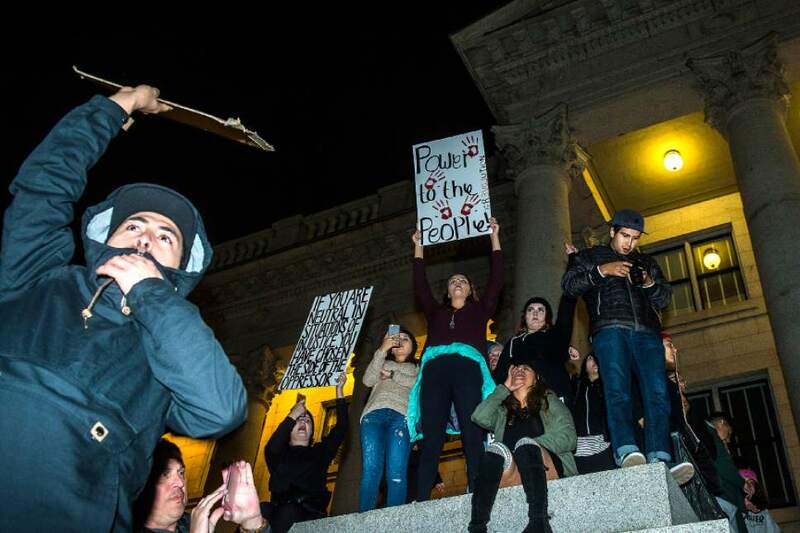 Chris Detrick | The Salt Lake Tribune Anti-Trump protestors rally at the Capitol Thursday November 10, 2016. 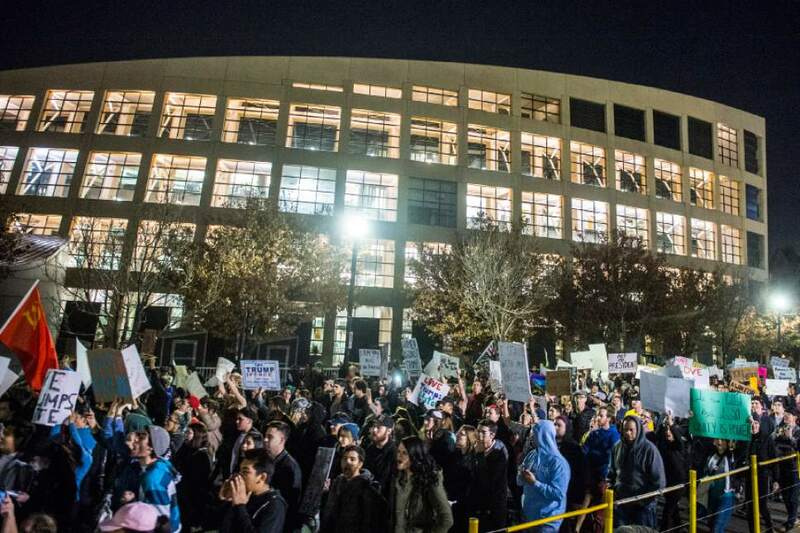 Chris Detrick | The Salt Lake Tribune Anti-Trump protestors rally outside of the Wallace F. Bennett Federal Building in Salt Lake City Thursday November 10, 2016. 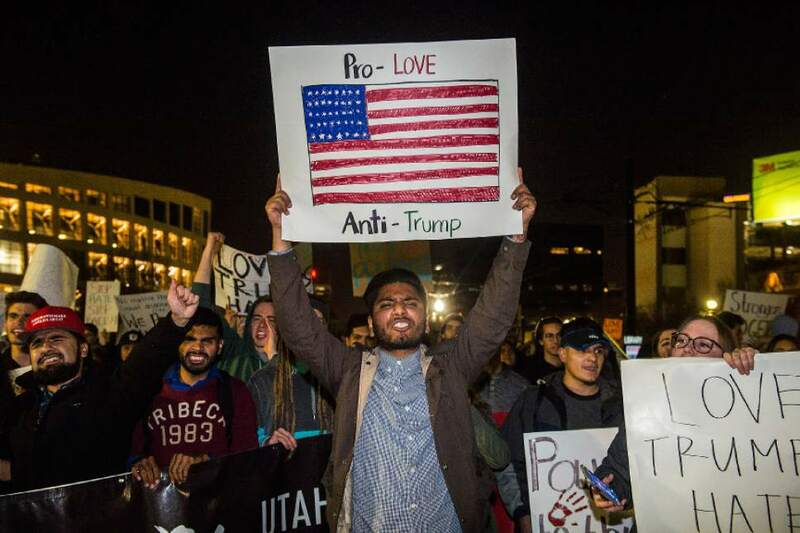 Chris Detrick | The Salt Lake Tribune Anti-Trump protestors march in the streets in downtown Salt Lake City Thursday November 10, 2016. 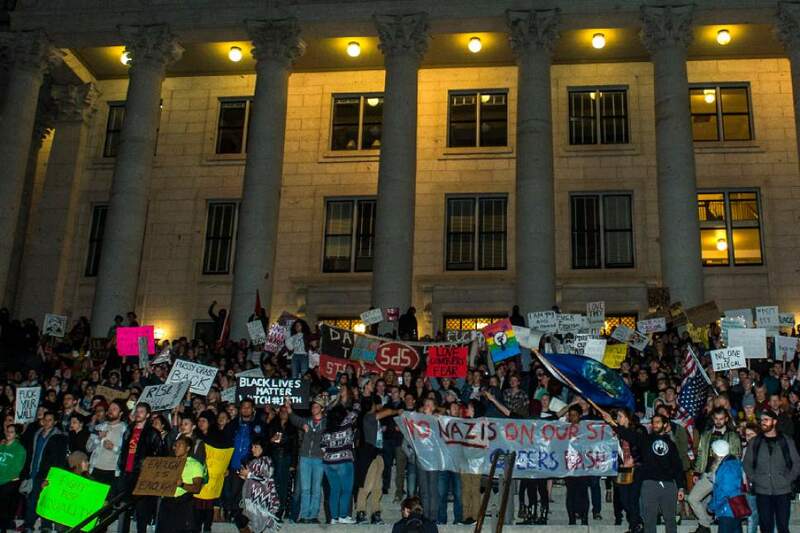 Chris Detrick | The Salt Lake Tribune Anti-Trump protestors march in the streets in downtown Salt Lake City Thursday November 10, 2016. 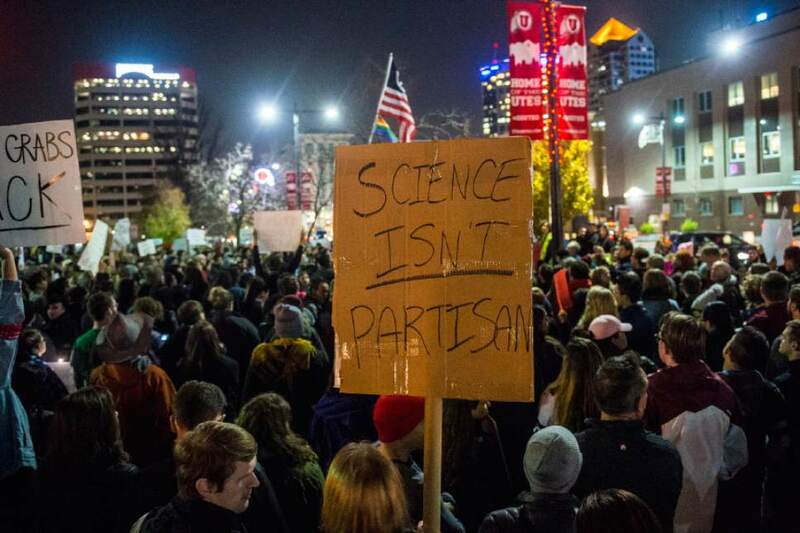 Chris Detrick | The Salt Lake Tribune Anti-Trump protestors march in the streets in downtown Salt Lake City Thursday November 10, 2016. Abraxia Juric wore a red nose and a pink wig as she marched down the middle of State Street on Thursday night. Her full clown attire, she said, was to protest President-elect Donald Trump. She feels he is a joke. "This entire election has been a circus," she said. Juric was one of about 1,500 people  some in similar costume, including a Trump mask with a drawn-on Hitler mustache  rallying against the Republican who claimed the presidency Tuesday in a surprising victory. 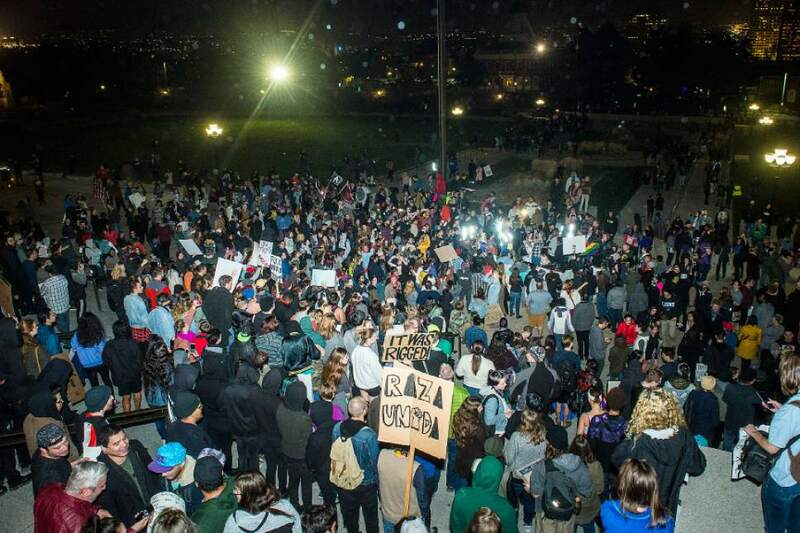 The demonstration marked a second night of rallies in Salt Lake City, with more planned for the weekend. 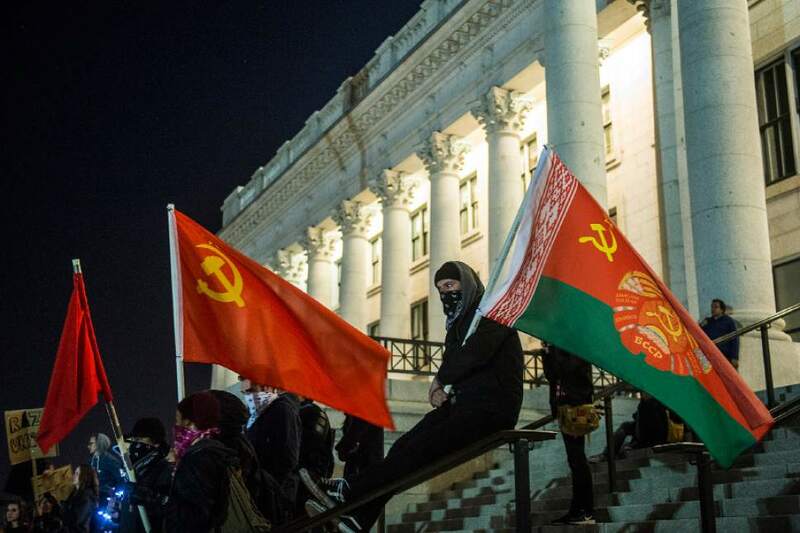 The protesters marched to the steps of Capitol, where Crystal Hall burned an American flag in protest. She said she felt disenfranchised as a disabled, transgender citizen. "The country that we&apos;re living in supports white supremacy," Hall told a reporter. 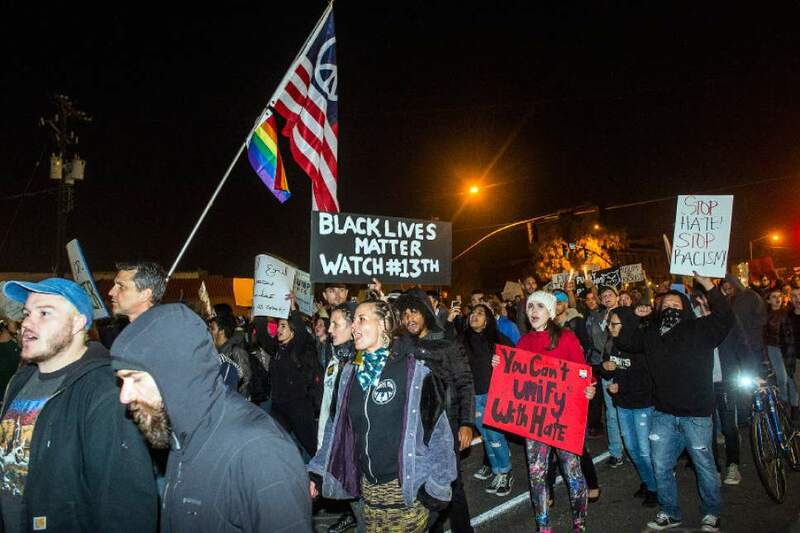 The protest began about 7 p.m. 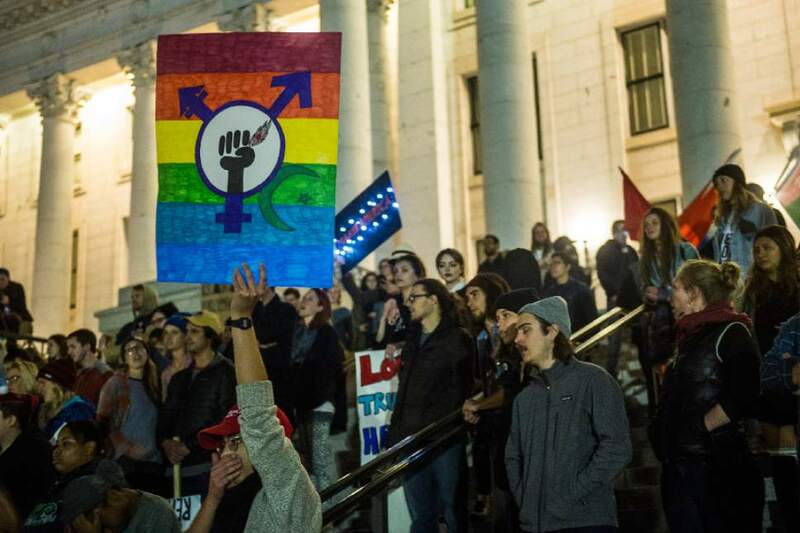 The crowd marched the streets of downtown  closing down traffic on each one  in the dark before they ended at the Capitol with cries of "Racist, sexist, anti-gay, Donald Trump go away." People watched the demonstrators from their apartment windows. Some joined the chants. Some flipped their middle fingers at the protesters. 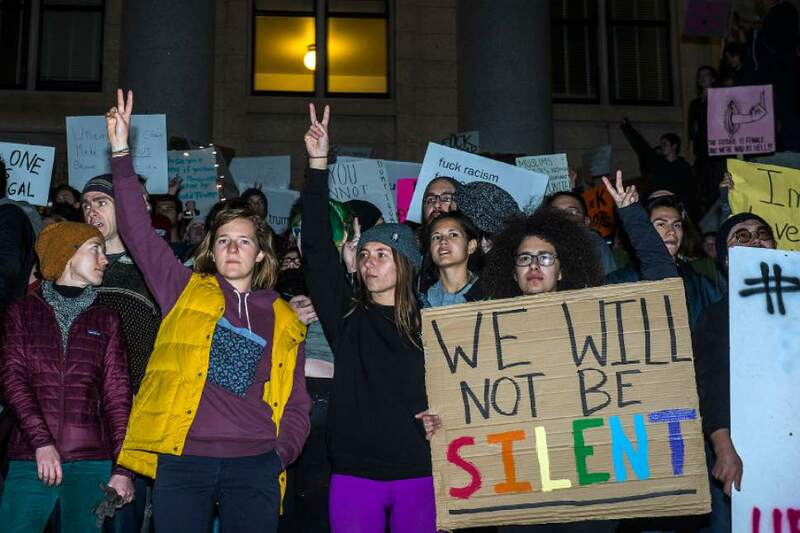 Though the rally was large, it was less turbulent than anti-Trump protests that have erupted across the nation, including in Chicago, Seattle and New York. 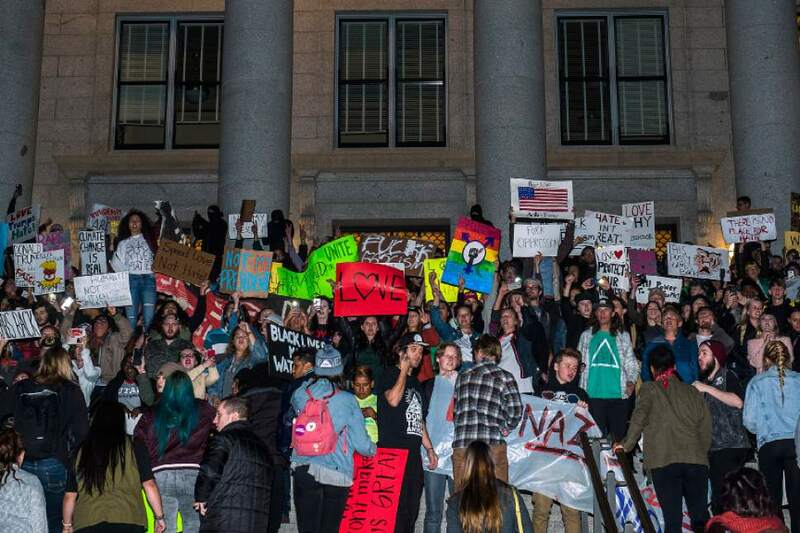 Salt Lake City&apos;s peaceful demonstration lasted more than three hours, with megaphone murmurs still sounding from a thinning group on the steps of the Capitol after 10 p.m. The rally focused on people of color, women and folks with disabilities  all groups Trump offended during his campaign. 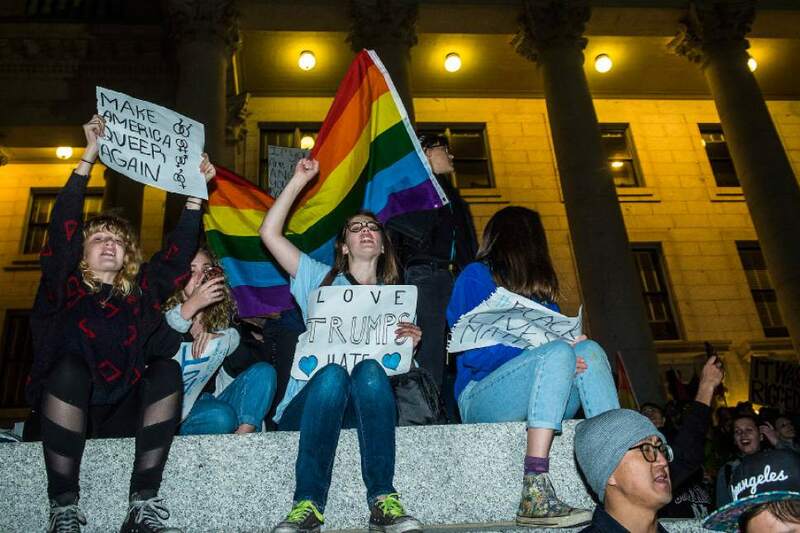 People representing themselves as lesbian, gay, bisexual, or transgender carried signs protesting Trump, too. Protesters started at the Bennett Federal Building, 125 S. State St., where pictures of President Barack Obama and Vice President Joe Biden hung inside the front doors. They decried Obama&apos;s replacement with posters calling Trump a fascist. Many banners read: "Not my president." Adrian Romero, who spoke during the hour of speeches and identifies as a queer immigrant, said Trump has "harassed, abused and taken from us." The crowd strained to fit on the sidewalk during the talks. "I think about all the peoples whose lives are about to be destroyed," Romero said. "This country isn&apos;t meant for people like you and me." Romero pleaded with the crowd to fight for equality and inclusion during the Republican&apos;s presidency. 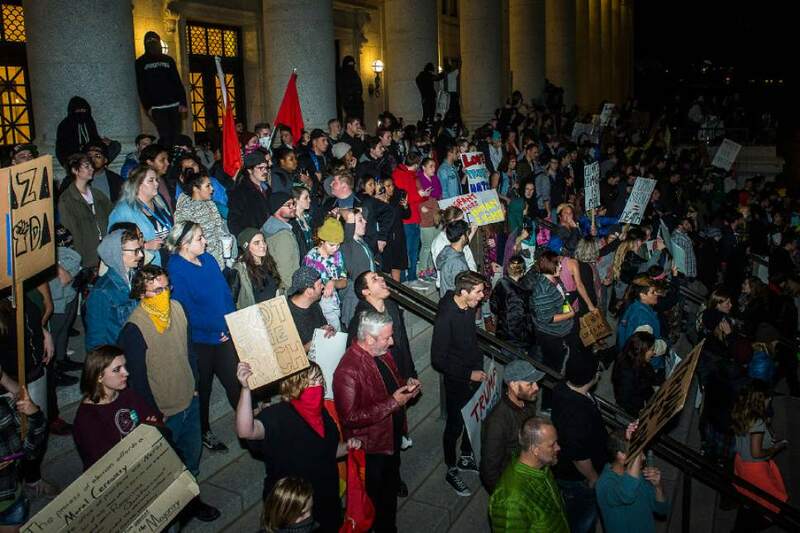 Then the crowd marched away along State Street, wrapping around the City-County Building and the downtown library. The group got so large at times that the front would chant something different from the tail end. A few candles illuminated faces as protesters walked. Elizabeth Cruz, 20, paraded down the street carrying Mexico&apos;s flag. She said it was for her parents, who immigrated to the U.S. when they were both 14 years old  they&apos;re now 50. "They came here to give us a better life," she said. "I don&apos;t feel like my family should be kicked out … [but] maybe my family should&apos;ve stayed in Mexico and we wouldn&apos;t be going through this path now." Many Latinos in the crowd rallied with "si se puede" (Spanish for "yes we can"). People of color said they fear Trump&apos;s remarks of deporting immigrants. Others worried about Trump&apos;s calls for banning Muslims and disparaging people with disabilities. Several people carried baseball bats, citing a concern for safety in the country. Isadora Clemente Zurie, 21, rode in her wheelchair with the crowd along 400 South. "I&apos;m disabled and I&apos;m LGBT. I&apos;ve been bullied all my life" she said. "Now I&apos;m in a world where for just being me, I could lose my entire life." The strong LGBT presence also found a voice in Juric, whose clown makeup included tears in rainbow colors. She said that represents her transgender boyfriend. She said what many others expressed: "This election makes him not safe."